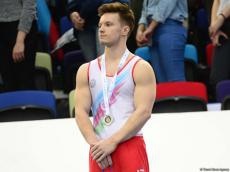 Azerbaijani gymnast Nikita Simonov, having scored 14,800 points, won the silver medal of the FIG Artistic Gymnastics Individual Apparatus World Cup in Baku, Trend reports. Simonov won the medal in the exercises with rings. The representative of Great Britain Courtney Tulloch (14.933 points) won the gold medal on rings, while Ukraine's Igor Radivilov ranked third in the top 3 with 14.666 points. The competition is important for athletes who want to get a license to the 2020 Summer Olympics in Tokyo.